As a companion parrot behaviourist I can offer help with behavioural problems in pet parrots. Such problems might include self-plucking, screaming, nervousness and aggression / biting. I use methods based on learning theory/behaviour analysis to ensure behavioural work with the birds is as bird-friendly as possible. This uses positive reinforcement (rewards) during training. I offer unbiased advice on caring for your parrot; how to overcome problems and maintain a good relationship with your bird. I emphasise the need for good basic training to maintain the trust between you and your bird. I also encourage safe indoor flying and explain how you can teach your bird to fly to and from you and other places on request, so there is no need for wing-clipping. Sadly, there are no quick fixes to most behavioural problems. While some issues can be resolved quickly, most will take some time and much commitment from the bird’s carers. Take great care when searching the internet for help. Behaviourists using learning theory / behaviour analysis should give you sound advice. My books offer step-by-step guidance on behaviour and teaching your bird to accept some simple requests or 'commands' from you. I have kept many parrots since the 1980s but do not breed, buy or sell any birds. • Explaining the causes of behavioural problems and suggesting solutions. • Offering advice on essential training for your bird, including safe flying; no need for wing clipping! • Giving personal, detailed advice by email or phone consultations to solve problems. 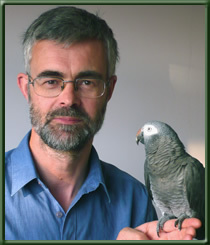 • Offering my books on companion parrot care direct to you. • Talks and training courses for veterinary staff, pet parrot owners and animal welfare organisations. • Advice to print and broadcast media on parrot related topics. I have written several books on parrot care. 'Breaking Bad Habits in Parrots' published by Interpet, is illustrated throughout with colour photos and includes step-by-step guidance on taming, training and solving behavioural problems. This book has more detailed information than my other books, regardless of which type of bird (Amazon, grey, cockatoo, macaw, cockatiel etc.) you have, this book can help you with your bird. Go to books page for details about Greg's books. See Greg's books and the sections on Essential information and Training your bird for more information on your bird’s needs.